:: Question of the Day: Do I really need an eye cream? Spring is almost here! Start getting ready for summer with a smooth, glowing complexion courtesy of our Facial of the Month. And don't forget about our Beautiful Benefit this Saturday! We'll have goody bags for all participants, door prizes, and great discounts the day of the benefit. What a great thing to do with your girlfriends! There are still spaces available - read more info below and call us for tickets at 271.2710. Since the days of Cleopatra, women have been using lactic acid (from sour milk) to make their skin look radiant and more hydrated. This is a lighter chemical exfoliation and is perfect for all skin types, particularly those with acne, dry skin, sun-damage, large pores, and fine lines - just to name a few. Start off spring right with a new look and feel to your skin. Queen Cleopatra must have known what she was doing; after all, she did enchant the famous Julius Caesar! Whether you are looking for a corrective product line to reverse the signs of aging or just want to maintain that youthful appearance, Caniglia MD Skincare offers a full line of antioxidant-rich medical-grade products to help you achieve your goals. The Caniglia MD Skincare line was developed after extensive research and experience in the medical field. A leading Facial Plastic and Reconstructive Surgeon, dealing solely with the face for over 17 years, Dr. Caniglia knows the importance of good skin care products and has used his expertise to develop a skin care line that provides RESULTS. Dr. Caniglia was awarded 2007/2008 "Top Physicians" for Facial and Plastic Reconstructive Surgery by the Consumers Research Council of America. Caniglia MD Skincare products are all ethically developed, never tested on animals and use natural earth-harvested plant ingredients, pure botanical extracts, essential oils and purees. Our goal is to give you the beautiful, younger-looking skin that you deserve. The Caniglia MD Skincare Line will bring new life to your face and leave your skin healthy and glowing. Caniglia MD Skincare is dedicated to providing a full product line of cleansers, facial toners, corrective serums, eye creams, and moisturizers to patients of all skin types, allowing you to maximize the beauty from within. Purchase 4 or more products from our new top of the line skincare and receive a 20% discount. If you purchase individual items you will receive a 10% discount. This offer is valid through the month of March only so don't miss out! This would be an awesome Mother's Day gift! The cost per ticket is $40 with half of the proceeds going to Soroptimist International. There are a limited number of seats available so be sure to book today! Call me at 271.2710 to reserve your spot! Question of the Day: Do I really need an eye cream? You know, I searched and searched online for info that is unbiased and I finally just decided to give you my honest opinion and what I feel has worked for me! I personally believe you need an eye cream, particularly once you hit 30, but you can always start in your 20s. I noticed last year when I went to Alaska that my eyes were looking a little creepy. It totally freaked me out and caught me completely off guard. Ever since then, I have been using an eye cream. I can tell a difference and so can some of my friends. I hate things in a jar - I want everything to be in a pump. Let's face it, how many of us actually use a q-tip to take product out of a container? I have tried several eye creams/gels over the last year. Now I have found one I like. I think that my eyes look more refreshed and the lines do not look as noticeable. We all know that we are going to age but nothing says we just have to let it all go! You want to use eye creams that have the right feel for your skin. Some people like thicker creams and some people like gels. I think you have to try a few to see what you like the best. You really need to look for an eye cream that has anti-aging ingredients and that does not use perfumes, fragrance or dyes. Because the eye area is so tender and is generally dehydrated, you need one that will be gentle to the eyes and provide the moisture that you need. Drinking plenty of water, getting enough of sleep and protecting your eyes from the sun is a must. If you need a quick "eye treatment" in the AM you can use cucumbers, but finger tips or pads that have been rinsed under cold water can work as well. Colorescience's Shrinking Violet is an awesome Eye Treatment in the AM. I love this stuff. I use it after I have applied all of my make-up and tap it around the orbital bone (the eye area). It really brightens my eyes and I look more refreshed. Could you just use your face moisturizer? Some people say you can and others don't. I have never used my face cream for my eyes. I think the consistency is different. Special Offer: Book a facial in the Month of March, mention this newsletter and receive a Complimentary Travel Size Eye Cream from our new skincare line (a $5-8 value)! Charm your own Caesar after a glorious Milk Bath to rejuvenate your skin. Simply add 2-4 cups of milk or buttermilk to a warm bath, soak for 20 minutes or so, and scrub the loosened skin cells away from your body with a washcloth or loofah in soft, circular motions. Be extra gentle with delicate areas of your skin such as your neck and thighs to avoid abrasion burns. 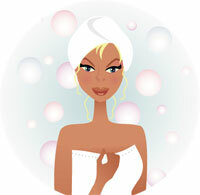 Be sure to rinse your skin with a luke warm shower and rinse the oils from the tub. Your skin will feel slick - this is normal, so just crawl in bed and go to sleep, letting the milk work its magic. Your skin will feel soft and supple, just like a baby's.